I’m torn. Alice Kuipers’ 40 Things I Want To Tell You didn’t quite reach the level of expectation I had for it, sadly. Its a coming of age story about Amy (a.k.a. Bird), an organized, predictable, self-assured young lady with the grades, the drive, and an advice column on the side. She has everything planned – all the time. Except she’s suddenly become tired of being herself, which compels her to do something utterly unthinkable, utterly wild. Unluckily, her one momentary stray into the promiscuous results in not freedom, but quite the opposite. So, the problem. While I didn’t find the actual story as engaging as I’d hoped it would be, it was more what it achieved in my mind, what it stood for, that I responded to. Amy’s story is not sweet, or comforting. At first, it seems like a typical life of a quirky, systematical girl. Funny, entertaining with parties, and homework sessions. But it quickly turns, spirals. What I love about the UK (this is based in England), and I’m finding this in their television programs as well, is that there is no glamour. For being one of the fashion capitals of the world, and the cultural envy of many, they don’t seem too preoccupied in selling themselves under guise of sweetly-coated lies. There’s no sense of trying to live up to the expectations of our fantasies, or satiate our hunger for fancy. They deal with the real, and sod everything else. Bitter, but true. They don’t concern themselves with fairy tales they know won’t come true for most of us. These are hopes that are attainable. They want us to dream in this world, not some far off land that only exists when we close our eyes, cover our ears, and blanket our hearts from reality. I say this because 40 Things deal with serious issues. And in the end, some get a happy ending, and some don’t. Some may think it ended believably, some may think the author was being unnecessarily cruel. But life isn’t always sentimental, is it? The universe doesn’t always consider your happiness when its turning on its axis. Too many people on this planet to please. You must seek it yourself. You have to look for the good because it doesn’t come as easily as the tragic. Its like shifting gear, or adjusting your eyes…and only then does the light come into view. This was a good book, I only mean that what’s between the lines is much more impressive. The point, rather than the structure. You get some genuinely good, likeable characters like boyfriend Griffin, and best friend Cleo. Pete, however, I found lacking. He was a complete mystery throughout, especially since he plays such a critical role; it was hard to soften up to him. There was no insight to his character, thus no growth. His decision in the end, what you might call his “attempt at redemption” was not at all an attempt at redemption. But again, some people might think its “real”. And it is, you know. It happens. But I’m simply arguing that if he were real and standing in front of me and got me to swallow all that bull, I would’ve socked him in the face. Finally Amy, or Bird. She was an acceptable protagonist. There were times I applauded her and times when I was frustrated with her decisions, but what can you do? You only get what you have on the page. Forgive this long non-review. I say give it a try…it doesn’t take too much effort. I finished it in two days. And even though my expectations weren’t exactly met, I certainly still count this as a success. It isn’t always whether or not the story was your taste, sometimes its just about what you are left with once its finished. After all, that’s what really lasts: the feeling, not the words. I can’t pinpoint it but I really like the cover of this one. 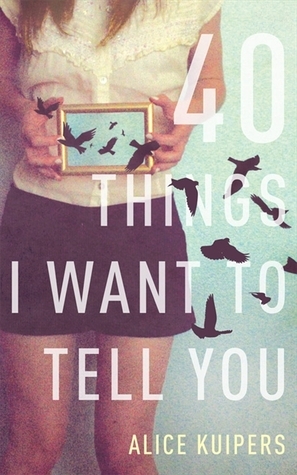 I don’t know that 40 Things I Want to Tell You is for me, but I think one of my sisters would like it. And you are so right, it is the feeling that you just can’t shake about a book. That is what matters. I’m sort of curious as to what I’ll think of this book now. I love the title and cover. I know the author of this one is a Canadian so I’ll probably give it a try even if this wasn’t what you expected, K. I do like that you felt as if the characters were real and that not everybody got a happy ending. Actually, the author is from the UK, but she resides here in Canada, so I counted her as a Canadian author – which is probably a little bit like cheating but meh :) Read it, though, because you never know! K, I know the most difficult reviews to write are the ones where the book is just average. You did a great job conveying your thoughts in an honest way. Thanks for that. I don’t remember hearing about this one before, but it sounds like an intriguing read. I like the realistic sound of it, and the story idea. Will have to keep this one in mind. This is the first review I’ve read for 40 Things. I think you stated your feelings so well. I happen to love Brit fiction. I love the no-nonsense less sentimental approach. I’ll definitely give this book a try. Great review! I love anything and everything British. Its the same with their shows, which I love but do occasionally get frustrated with. Sometimes I like a good sentimental story. Hmmm…this is the first time I’ve heard of this book, but the overall idea sounds interesting. I tend to like books that cut the crap and feel realistic…meaning they don’t always sugarcoat everything, even if it means that not everyone gets their happily ever after. I think I’ll look into this one more, though I’m going to hold off on buying it for now. Well, read it anytime you can but its true. This isn’t a fairy tale look on life, which I appreciate because we can’t completely get lost in fantasy, right? I’ve really been looking forward to this book, and I’m loving how it has been getting so many different and mixed reviews. Thanks for the honest review–I think I will check this one out. Lovely cover! Yes, I love the cover, too! I’m glad you would still recommend this despite all the issues you had with it. Thanks for the helpful review! I’ll be sure not to set my expectations too high. I remember reading about this in your Canadian YA post and I immediately added it to my to-read list. I know this review isn’t the most optimistic but yes, please give it a try. There are many rave reviews out there, so its probably just me.